Big batting stars in your side help you post huge totals, but what if they fail and you have to defend a small total? You have US$12 million to build a T20 team. You really shouldn't end up with Corey Anderson bowling your death overs. But at Royal Challengers Bangalore in the 2018 IPL, that is exactly what happened. And not just once. By the end of the season, Anderson had bowled 8.4 overs - and conceded 115 runs. Anderson bowling at the death was a deliberate choice. It was certainly not that Bangalore designed a team with Anderson as the death bowler in mind. Instead, it was that they designed a team based around the effervescent batting of Virat Kohli, AB de Villiers, Brendon McCullum, Quinton de Kock, Colin de Grandhomme and Anderson himself. And, having spent all that cash on those batsmen, there wasn't much left over for the bowlers. While a team like West Indies can pack their side with batting but still have a fine bowling attack, in franchise cricket every batsman bought means less to spend on bowlers, and every elite overseas batsman means an overseas bowler fewer in the XI. "Definitely RCB were a batting team," says one team insider, speaking anonymously. "It just worked that way with the big three. They fell into it with Gayle, AB and Virat, and then found it difficult to afford the best bowlers." In recent years, Royal Challengers have been the purest distillation of a side focusing on batting over all else. 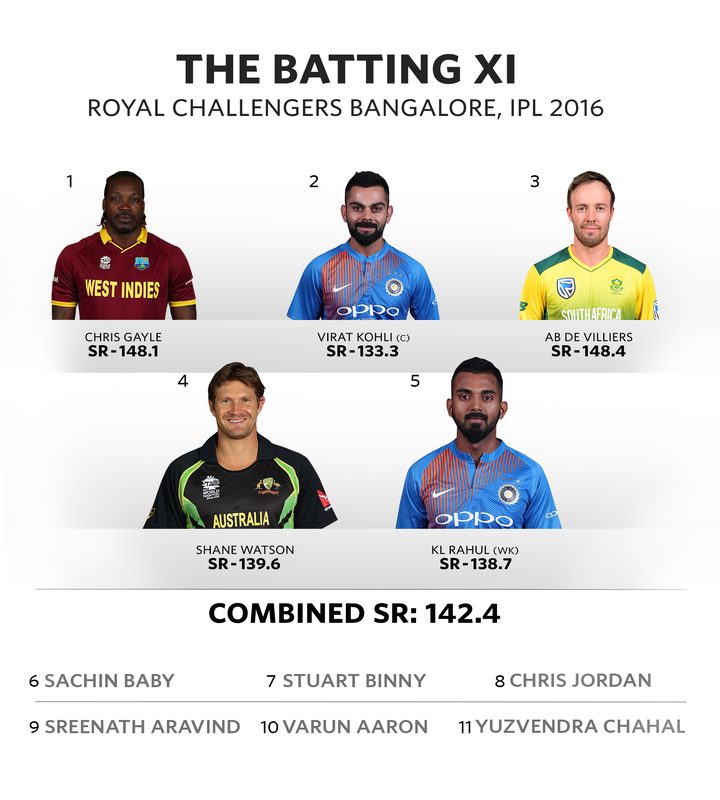 And so they have developed one of the most revered batting line-ups in all of T20: in 2016, Kohli and de Villiers shared a partnership of 229 in 96 balls as Royal Challengers reached the final. Uniquely, Kohli and de Villiers have shared two T20 partnerships of over 200. Kohli and Chris Gayle also put on over 200 for Royal Challengers, who thus have three times as many 200-plus partnerships in T20 as any other side. RCB's perfect game can probably beat anyone else's. 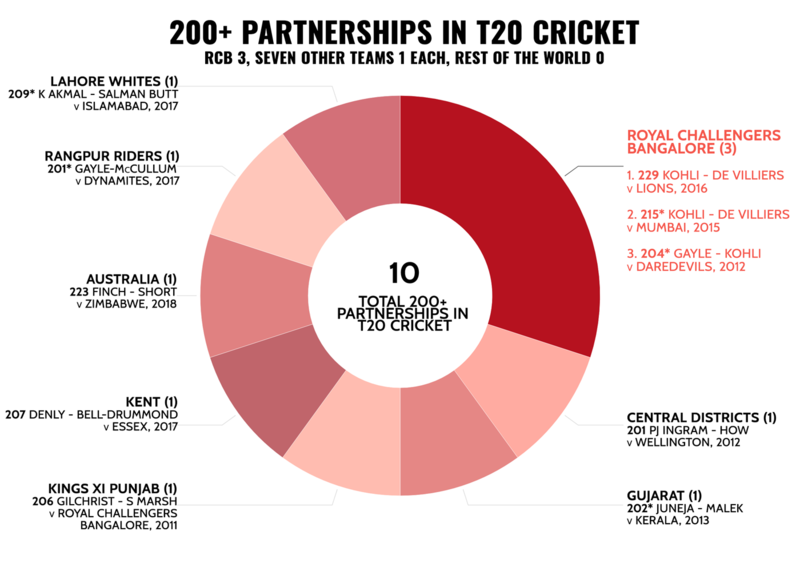 In a way, Royal Challengers' strategy has been to embrace the fundamental inequity of T20 - a bowler is limited to 24 balls, while a batsman can be there for an entire innings - and prioritise players who can have the greatest possible impact on a game. When it all comes off, there is nothing quite like it, as anyone who has been to the Chinnaswamy Stadium and witnessed one of those Kohli-de Villiers partnerships on flat batting pitches will attest. The snag is that securing those two requires stumping up a lot of cash. In 2018, RCB paid Kohli and de Villiers a combined 28 crore ($4.4 m) - over one-third of their entire allocated playing budget. 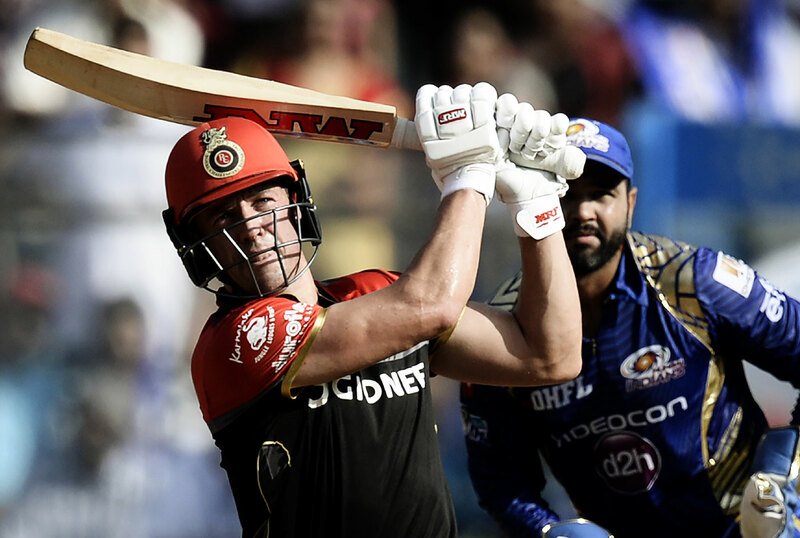 Both batsmen enjoyed terrific seasons, but RCB's paucity of bowling options and underwhelming batting returns from the supporting cast meant that it was not enough. Over the last two years, Royal Challengers have won nine out of 28 IPL matches, the worst record in the league. This is no slight on Kohli and de Villiers: they have scored 1534 runs at 40.37 in this time. Unwittingly, RCB have served as a case study in the perils of building a franchise in which a team's budget, and strategy, is excessively concentrated on batting. The imbalance means that the disadvantage of batting first is exacerbated. Too often the bowling has been, as Kohli put it after failing to defend 205 at home to Chennai in 2018, "just not acceptable". Nottinghamshire in 2017 were perhaps the most successful iteration of a side that was batting-dominant. Peter Moores, Notts' head coach, asked the groundsman to produce the best batting pitches that he could. "We left the boundaries shorter, though they're never that big at Trent Bridge," says Moores. "We knew our own pitch and the scores were going to be high and we had to play accordingly." Tom Moody believes that bowling is more important when matches are low-scoring; Notts' strategy suggested that, conversely, batting becomes more important when matches are higher-scoring. While the Notts bowling attack, with Jake Ball and Harry Gurney adept at the death, was stronger relative to their league than that of Royal Challengers, Notts' success was underpinned by their power with the bat. Remarkably, they twice won matches in which they conceded over 220 - winning by five runs when defending 227 against Derbyshire, and then chasing 224 against Yorkshire with five balls and five wickets to spare. Over 15 completed games, Notts topped 180 nine times and 200 on four occasions. Against Durham, they chased down 184 with a ludicrous 37 balls to spare. "After six or seven overs watching it, I thought we were going to win. They weren't scoring at a good enough rate," Moores recalls. "I thought at the time 180 was never going to be enough, the way we were playing. We won at a canter." For all the brutal ferocity of openers Alex Hales and Rikki Wessels, who both topped 500 runs in that campaign, depth was the greatest hallmark of Notts' batting line-up. In their quarter-final they were 34 for 3; in the final, they were 30 for 3. Yet with Brendan Taylor and Samit Patel at Nos. 4 and 5, followed by Dan Christian, one of the format's leading finishers, Steven Mullaney and then Billy Root - picked as a specialist batsman, at No. 8 - Notts twice recovered to win easily. Such middle- and lower-order ballast wasn't just desirable in and of itself; it also empowered the top order to aim further and higher and throw off the shackles. "Billy is like that security player at eight. If you do lose a few up front, you know you've got a good player down there," Moores says. 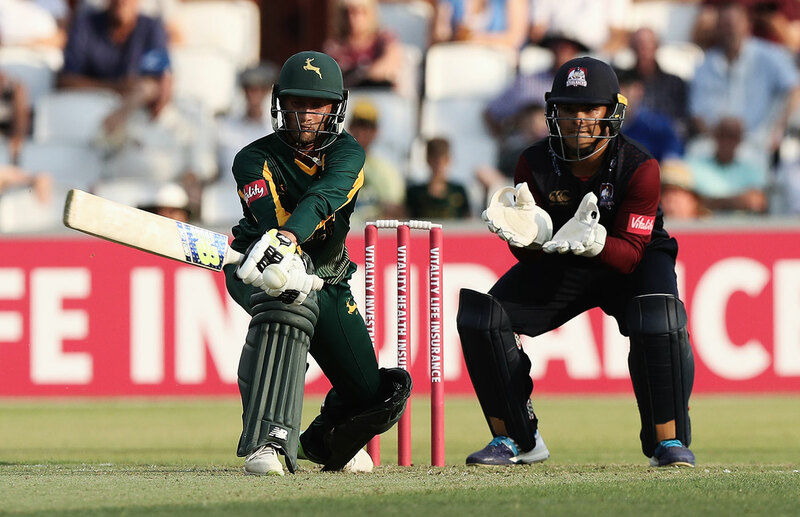 And so although Root only batted four times in his ten games in 2017, the security that he provided enabled Notts to push the frontiers of T20 batting. The team put emphasis on targeting the overs from the seventh to the tenth - traditionally the post-Powerplay lull, with batsmen content to play low-risk cricket at a run a ball. No longer. "You're trying to find areas where you might gain a bit on somebody else," Moores explains. "We tried to keep pushing on out of that and keep that scoring rate up through those overs, and tried to avoid having a period where we just had a flat spot." Happily, the team found that "when you're playing even though you go hard at it you don't seem to lose many wickets either." For players, the effect was liberating. Moores inculcated a spirit of "complete freedom," Taylor recalls. "When someone had an off day the next person stepped up, which is a sign of a very good team." That was exactly the point: with a batting line-up as ferocious as Notts in 2017, the opposition knew that there was always someone else.